Money, Power & Respect, the 1998 debut from The Lox, is a great album. I’ve been listening to “Let’s Start Rap Over” a lot lately. I love that record. Advancing your career is a challenge, to say the least. It’s tough to land a new job. It may be just as daunting to go to your boss and ask for more. And yet, for many professionals, that’s exactly what is required for you to move forward. When you are pushing upward, remember three words: money, power and respect. When I urge community professionals not to sell themselves short, it’s these three things that represent advancement. Because if it’s not about money, power and respect, it’s just words. If you are handed a new title and more responsibility (e.g. more work), but you aren’t given a raise that reflects the higher level demands that will now be placed on you, are you really advancing? As much as we might try to avoid money and be uncomfortable bringing it up, we have to do so. However, I have a simple way to make this easier for you: use a compensation study. The best one available right now was released by The Community Roundtable. This is especially helpful if you are paid average or below average money. Use the averages, specifically, and account for a higher cost of living if you live in an area that is higher than the national average. For example, if you are a director of community working in New York City, being paid $90,000, you are being paid well below the national average. When you account for the higher cost of living in New York City, it’s exacerbated even further. Unless you are bad at your job, you are substantially underpaid. If it seems like your boss isn’t willing to give you a raise, you can ask a simple question: do you feel that I am above average at my job? Hopefully, they say yes. In such case, it seems reasonable that you would be paid at least average for your profession. That’s a sensible argument, and not a hard sale. If you and your boss disagree on whether or not you are worth average pay, then it might be time to move on. Even if you are already paid above average, you can still use the salary ranges. If the average is $110,000, but the range is $39,000 to $240,000, and you’re being paid $125,000, you have a long way to go before you even approach the top end of that range. Beyond job performance and geographic location, don’t forget to account for inflation and cost of living increases. Let’s say you haven’t received a raise since February 2013. According to this calculator, the rate of inflation from February 2013 through June 2015 is 2.79%. On average, it costs 2.79% more to live now than it did back then. You can make a reasoned argument for a raise that, at the very least, matches inflation. Note: there can be extenuating circumstances. Early stage startups, for example. You might be offered a competitive equity package that augments your below-average salary. That’s a choice you can make. You’ll want to ensure that your equity is competitive and in line with what others are receiving – especially those who are joining the company at the same time as you. Also, salary isn’t the only way to boost your compensation. This includes any benefits that have actual, financial value to you. Not things like free t-shirts or stickers (which I’ve actually seen in some job descriptions – I’m serious), but transportation, child care and insurance. A better word for “power” would be “autonomy” – greater control of your own destiny. In general, talented community professionals like to be able to actually guide community efforts – not be dictated to by someone who doesn’t live and breathe community. For that reason, advancement means greater responsibility and increased freedom to make choices. Instead of having to run certain decisions by a higher up, you are empowered to make them. A good way to make a quality professional leave is to fail to give them this freedom. If they are great at what they do, they’ll find someone who will hire them and give them that freedom. Of course, this does not mean that there still aren’t some decisions you must run by other people. It also doesn’t mean you won’t solicit feedback from others before you plot your course. It just means that when it comes to community, you have a greater say and the ability to actually guide community for your organization. This is a great responsibility, as well. The decision-maker is often the person who is held most accountable – this means you’ll be more likely to take the blame when things don’t go right. But that’s par for the course, if you want to advance. By compensating you better and giving you greater authority, the people you work for are demonstrating respect for your efforts. However, I want to talk about respect in a different light: your title and the flexibility you are afforded. As I said above, a new title without a raise doesn’t feel much like advancement. But having the same title for several years may also lead to a similar feeling. This isn’t an ego thing as much as it’s a practical one. While you, personally, might say “titles mean nothing,” they actually do have an impact when you go to find your next job. Even if you love your employer and don’t see yourself leaving, you owe it to yourself and those who depend on you to look out for your future. One small part of that: ensuring that your title reflects your seniority and what you actually do. Strictly speaking, all things being equal, it’s easier to become a VP of community and support when you are a director of community than when you are a community manager. Even if you did the exact same work, people don’t always read the full story or grasp it. As such, when you are climbing the ladder, gaining responsibility and earning more money, don’t neglect a title. Job titles are the bullet points of your career history. Another form of respect is flexibility. The more you demonstrate your value, the better you are at your job, the more reasonable it can be to expect some flexibility when it comes to your work. Maybe you want to work from home sometimes. Maybe you want to travel a little more and work from the road. Maybe you want different hours that work better around your life. More and more, satellite offices are a thing but traditional office environments are still overwhelmingly dominant. For that reason, if you have proven yourself to be very dependable and trustworthy, your employer could provide you with respect in the form of flexibility. If they won’t, another employer might be more than willing to do so, if you are an asset. Money, power and respect. It’s that simple. That’s not to say that praise is worthless or that kind words don’t help us, but if you want to advance in your career, those kind words should eventually lead to actions that move you forward. 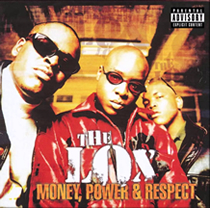 Listen to the title track from The Lox’s Money, Power & Respect album (clean mix).